The Foothill Extension crossing of Mountain Avenue near the Monrovia and Duarte border. Photo: Gold Line Foothill Extension Construction Authority. MONROVIA, CA – On the heels of last week’s completion of all light rail track installation for the Foothill Gold Line from Pasadena to Azusa, the Foothill Gold Line Construction Authority (Construction Authority) announced today that the agency has achieved another major milestone for the project – completion of all 14 at-grade (or street-level) crossings for the 11.5-mile light rail extension. The final grade crossing work, at Mountain Ave., was completed this week – three months ahead of schedule. Work began on the grade crossings in February 2013, and required long-term closures of each street. 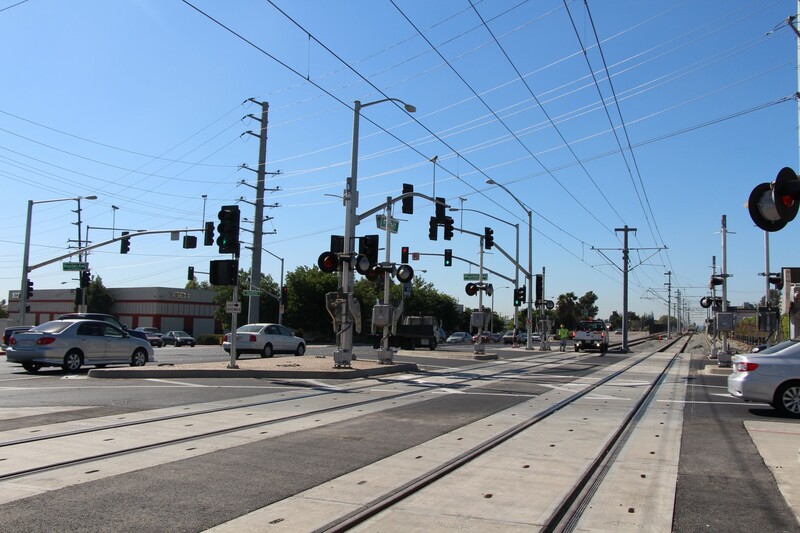 Each grade crossing received upgrades to underground utilities, the roadway, sidewalks, curbs and gutters, in addition to installation of light rail track, signals, and communications and safety equipment. The Construction Authority implemented targeted public outreach campaigns for each crossing that included door-to-door walks, text message noticing, e-alerts, interactive construction map updates, online and print advertisements in regional news publications; public banners and signs; and presentations to schools and community groups. To assist residents and businesses, the Construction Authority also sponsored shuttle service when pedestrian access was unavailable, advertisements for local businesses, among other measures. The “12-station extension” consists of the six stations you named and the six being planned for another segment that hasn’t been funded yet: Glendora, San Dimas, La Verne, Pomona, Claremont, and Montclair. The construction isn’t going to be continuous – the first segment will be turned over to Metro in 2015 but the second segment won’t break ground till at least 2017 – so it’s misleading, perhaps even dishonest, for the Gold Line Foothill Extension Construction Authority to call the two segments one project. It’s not dishonest. Phase one is funded by Measure R and is being built, phase two is unfunded but is in Metro’s long-range plan. I think the Construction Authority has clearly stated that. The Foothill Gold Line extension includes 12 stations. This is the first phase which consists of 6 stations. The second phase consists of an additional 6 stations (Glendora, San Dimas, La Verne, Pomona, Claremont, Montclair). Does the $2 billion price tag cover all 12 stations to Monclair, or just the first six stations to Azusa? If its the former (12 stations) then the CA statement is fine. If its the latter (6 stations), then the statement is misleading and should be changed. Yes, the $2 billion estimate includes the two phases that would take the line to Montclair. I don’t know why a couple of people believe the following is inaccurate — it clearly says that there are two phases and that the Pas-to-Azusa segment is funded and the other segment is not. What about the grade separations? – What’s the status on those? Yay, more at stupid grade intersections! I imagine that the number of bridges that Expo Phase II had to build has taken them longer.